I just finished this book, and thank goodness. It is about a woman who is coping with her husband's severe brain injuries after he was hit by a car. It is depressing and weird. For the first few pages I just wanted this book to be over because it was so hard to read. It is kind of random and pointless. It is a memoir, so it is writting sort of like a diary. It is nothing like the last book I ready, Marley & Me, who's author was a great story teller. It does get better towards the end, and I even laughed out loud at some parts. But I still wouldn't really recommend this book to anyone. 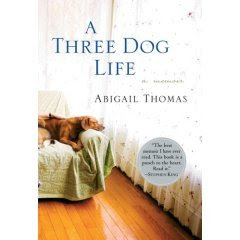 I bought it thinking it would be a charming story about this woman's life with her three dogs. Parts are, but this isn't worth it. You can borrow it if you want!